Scientific research is usually verbally communicated to policy officials or through purposefully written documents. This occurs at all levels of governance (local, national, and international). This month’s GeoPolicy post takes a look at the main methods in which scientists can assist in the policy process and describes a new method adopted by the European Commission (EC) that aims to enhance science advice to policy. Contrary to what is commonly thought, science-for-policy communication can be instigated by both scientists and policy officials (not just from the policy end). Scientists are increasingly encouraged to step out of their ‘ivory tower’ and communicate their science to the glittering world of policy. During my PhD, I presented my thesis results to civil servants at the UK Government’s Department for Energy and Climate Change. That meeting was a result of me directly contacting the department with a summary of my work. Scientists should not feel afraid to contact relevant policy groups, although this is perhaps easier to do on the local / national scale rather than on the international level. Surveys: Government organisations may send out targeted or open questionnaires to learn stakeholders’ opinions on certain topics. This method is used for collecting larger sample sizes and when the general consensus and/or dominant views need to be known. Interviews: one-on-one meetings are commonly used for communicating science to policy officials; either by phone or in person. These provide opportunities for in-depth discussions and explanations. Discussion workshops: the term ‘workshop’ is loosely used when referring to science policy. It can describe a semi-structured meeting where no predefined agenda has been set, or the term can refer to participants systematically discussing a topic with specific aims to be achieved (Fischer al., 2013). Workshops can involve solely scientists or combine policy workers and scientists (examples of the latter at the UK Centre from Science and Policy). Workshops usually result in a written summary which can be used for policy purposes. Seminars: experts give talks on their research for interested policy officials to attend and ask questions afterwards. For more tips on ways to communicate science to policy officials please read May’s GeoPolicy post. Policy briefings: may refer to a several types of written document. They are usually written after a workshop or to summarise scientific literature. Briefings are usually written by so-called bridging organisations, which work at the science-policy interface. These documents can be relatively brief, e.g., the American Geophysical Union (AGU) have published several ‘factsheets’ on different Earth-science topics, or more detailed, e.g., the UK Parliamentary Office for Science and Technology (POST) regularly publishes ‘POSTnotes’. Reports: these are far longer documents which review the current scientific understanding. The IPCC reports are key examples of this, but it should be noted that any long report intended for wider-audiences should always contact a short summary for policymakers as they almost certainly do not possess the time to read full reports. The Delphi method: this less-commonly known practice combines both individual and group work and is supposed to reduce biases that can occur from open discussion platforms. Experts answer questions posed by policy workers in rounds. In between each round an anonymous summary of the opinions is presented to the participants, who are then asked if their opinions have changed. The resulting decisions can then draft a policy briefing. Pairing schemes: an alternative method used to bridge the science policy gap. This is a relatively new initiative but examples have occurred on the national (Royal Society and MPs paired together in the UK) and international level (EU MEPs paired with European-based scientists). These schemes involve an introductory event at the place of governance, which include seminars and discussions. Bilateral meetings are then organised at the Scientists’ institutions. These initiatives aim to help participants on both sides appreciate the different working conditions they experience. The EU-wide pairing scheme encourages pairs to work together producing a science policy event at a later date. This is still to be determined as the initial pairing only occurred in January. 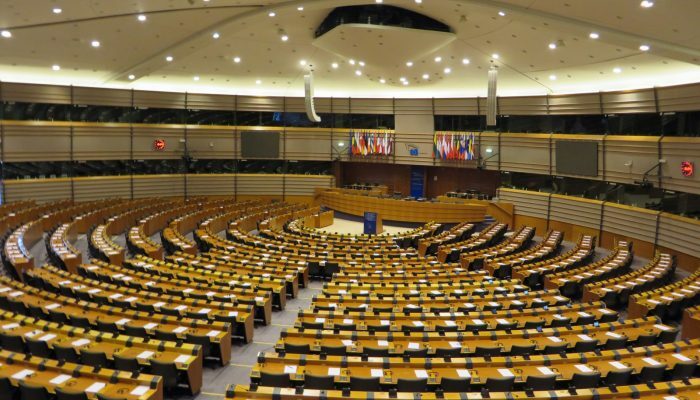 getting involved with third science-policy party organisations (for example, the European Parliamentary Research Service – EPRS). More commonly, scientists are contacted through the policy organisation’s extended personal network. This has been criticised as it can restrict the breadth of scientific evidence reaching policy, as well as it being not transparent. Under EC President Jean-Claude Junker, a Scientific Advice Mechanism has been defined, in which a more transparent framework for science advice to policy has been set out. The Science Advice mechanism. Slide taken from presentation entitled “A new mechanism for independent scientific advice in the European Commission” available on the EC Website. This mechanism aims to supply the EC with broad and representative scientific in a structured and transparent manner. 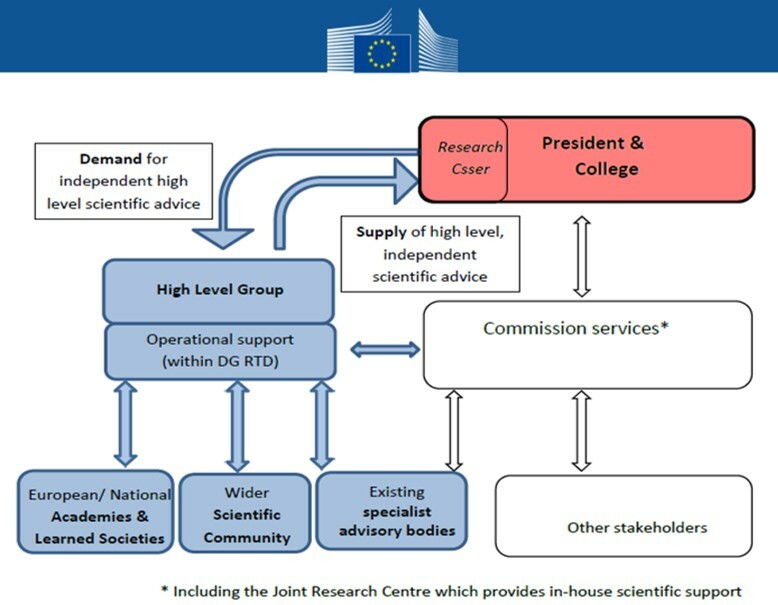 The centre-point to this is the formation of a high level scientific group which will work closely with the EC services. This panel comprises seven members “with an outstanding level of expertise and who collectively cover a wide range of scientific fields and expertise relevant for EU policy making”. This panel provides a close working relationship with learned societies and the wider scientific community within the EU. Since its initiation is 2015 the panel has met twice to discuss formalising this mechanism further. The minutes for the meetings are publically available here. More information about SAM is available in the EPRS policy briefing ‘Scientific advice for policy-makers in the European Union’. Previously, the EU had appointed a Chief Scientific Advisor, however this role was discontinued after 3 years as it was considered too dependent on one individual’s experience. A panel is thought to provide a broader range of scientific advice.